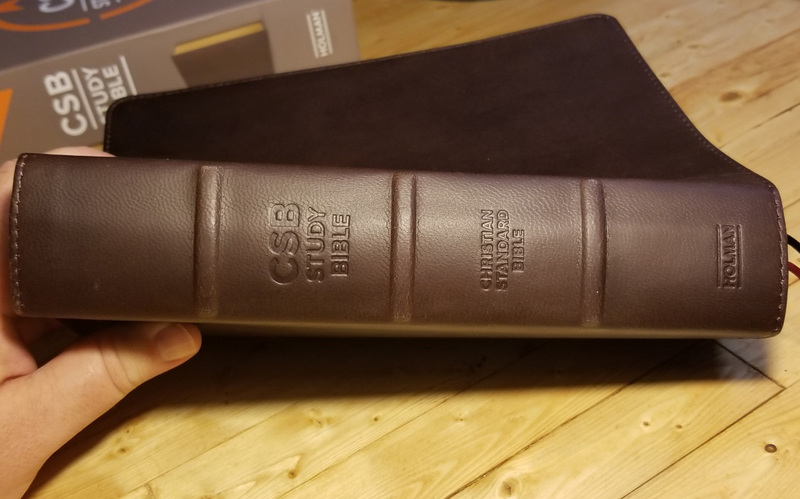 I was very pleased when I received a copy of the Holman CSB Study Bible in genuine goatskin leather. I have been curious for some time now on how well this Bible compared to some of the other nicer Study Bibles like Crossway’s ESV Study Bible of which I personally have an imitation leather Personal ESV Study Bible that I have been using for some time now. I have to admit that I am very impressed with the CSB Study Bible. I requested a copy from B&H Publishing (Holman Bible Publishers) to see how this particular Study Bible stacks up in regards to ease of use and more importantly helping people to understand better about the Word of God. The copy that I got was the genuine goatskin leather version. Holman came out with the CSB Study Bible a little while ago and I was very interested in checking this out. The more I read the CSB, the more I am liking it. From a design perspective, I really like this Study Bible and also, it appears to be made very well. The more than 15,000 verse-level study notes in the CSB Study Bible are fairly typical of what you would expect in a study Bible. 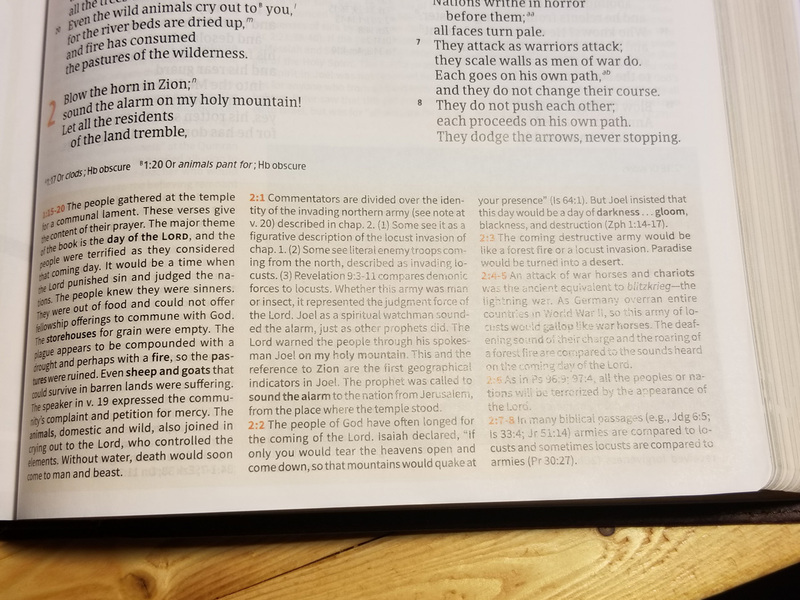 Since the CSB translation is a re-do of the HCSB (Holman Christian Standard Bible), it makes sense that the study notes in the CSB Study Bible are the same or at least very similar to what was in the HCSB Study Bible. I checked a handful of examples and while the formatting may vary a little bit, the content of the verse-level Study Notes seem to be the same, as do the book introductions. In addition to the study notes, there are 368 word studies, almost 100 photographs, and also many maps, timelines, articles, illustrations and charts that comprise the study tools. All of these are very well done and very helpful in your study of the Scriptures. If you are looking for a solid Study Bible then I think you will find this to be a very valuable option if you are looking for a Study Bible. Overall, I am really impressed with the CSB Study Bible and I would place it on my highly recommended list for sure. I received a copy of this Study Bible from the publisher in exchange for my honest review. Price: At the time of writing this review, the cheapest place to get this book is at Christianbook.com. They have it for $59.49– suggested retail from the publisher is $89.99. Please note that these prices do not include any potential shipping charges. If you would like to purchase this book, please support my blog and purchase by clicking any of the links to Christianbook.com on this page like the one below. If you want it in a different format, Click Here for those links listed below in this review. The CSB Compact Ultrathin Bible features the highly reliable, highly readable text of the Christian Standard Bible (CSB), which stays as literal as possible to the Bible’s original meaning without sacrificing clarity. The CSB’s optimal blend of accuracy and readability makes Scripture more moving, more memorable, and more motivating to read and share with others. 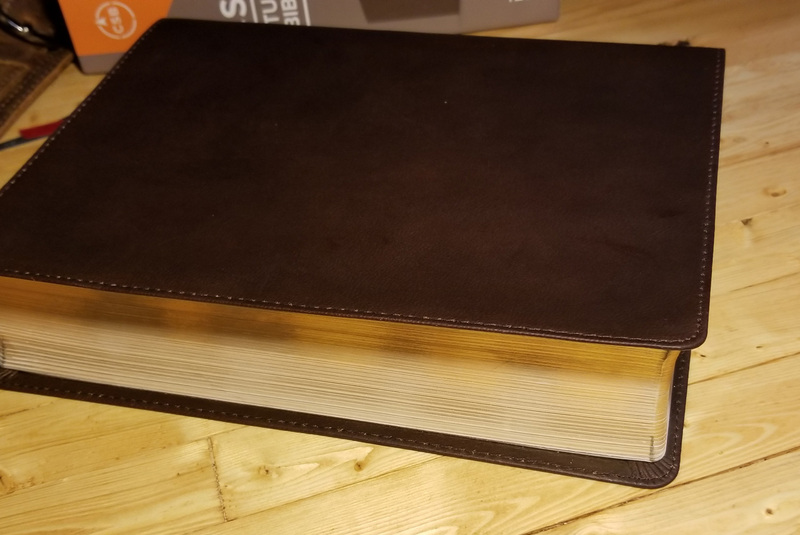 This particular version of the CSB STudy Bible that I am reviewing has a Genuine Goatskin Leather cover. Of course, you are able to get it in many different bindings. The leather feels very nice in the hand. The pastedown pages (the inside front and back covers are an imitation leather or some kind of synthetic material), which is fine. I would have preferred to see the inside also be made from goatskin leather. That would have given the cover an extremely flexible feel, which I personally like. The pastedown pages in the synthetic material, however, give a little bit more of a sturdy feel to the cover. Perimeter stitching is done very nicely and clean. The spine has three artificial raised ribs and the is stamped with “CSB Study Bible”, “Christian Standard Bible” and “Holman”. On the outside back cover, it is stamped with a smaller font showing “Goatskin Leather”. The CSB Study Bible had two fairly standard ribbon markers – one is black and the other is a maroon-ish red color. Pretty typical of a well-made Bible, you will see Smyth sewn bindings where they sew the different printed sections together to give the Bible a stronger binding. Honestly, the CSB Study Bible that I received for this review is one of the better lay flat Study Bibles that I have come across. Most Study Bibles will lay flat when you open it to within a few pages of Genesis. 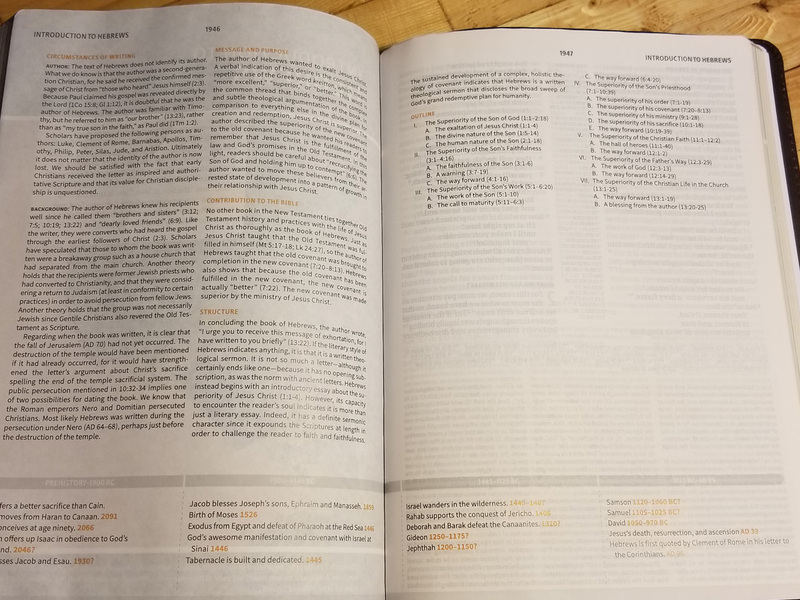 However, this CSB Study Bible actually lays flat for me right after the end sheets (4 pages prior to even the Table of Contents)! This is the typical single page presentation page with a field for each “Presented To”, “By” and “On” for you to fill out. This is a nice one-page write-up from Trevin Was about what the goals are of the CSB Study Bible. 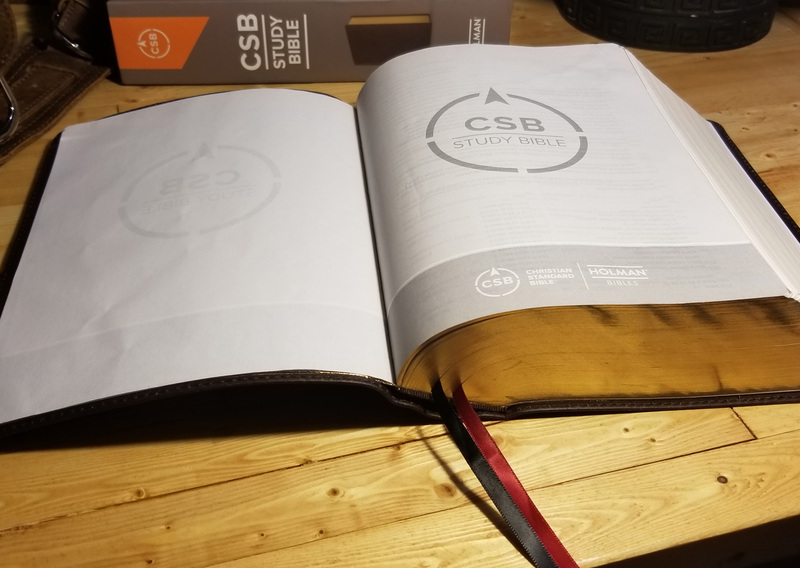 These six pages explain what the different features within the CSB Study Bible and also provide a visual representation of each of them. This is very well done and I would highly recommend you familiarize yourself with this as it will help you use this Study Bible to its full extent. One page that shows the editorial staff contributors that were involved in the creation of the CSB Study Bible. General Editors are Edwin A. Blum and Trevin Wax. Associate Editors are Steve Bond, E. Ray Clendenen, Christopher W. Cowan, and David K. Stabnow. 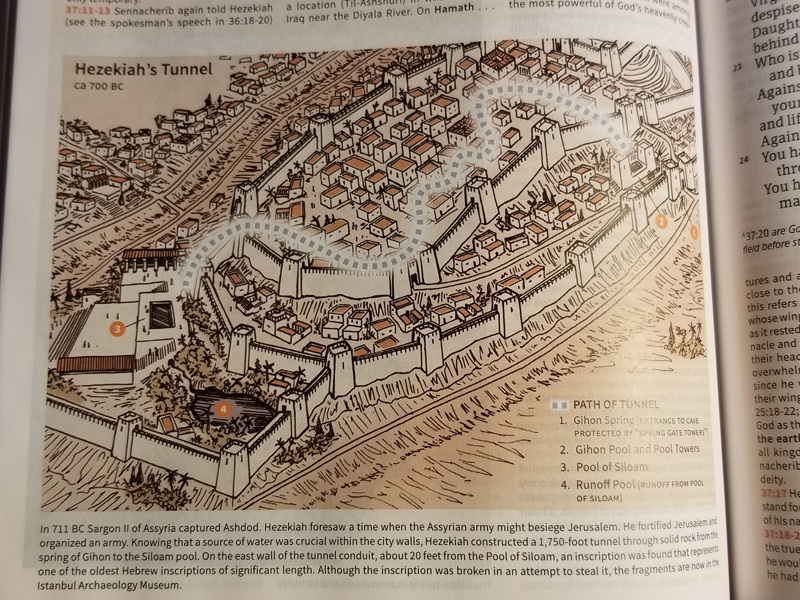 Three pages that list out the different maps Illustrations and charts used throughout the CSB Study Bible. Five pages listing out the different Hebrew Word Studies that are in the CSB Study Bible. 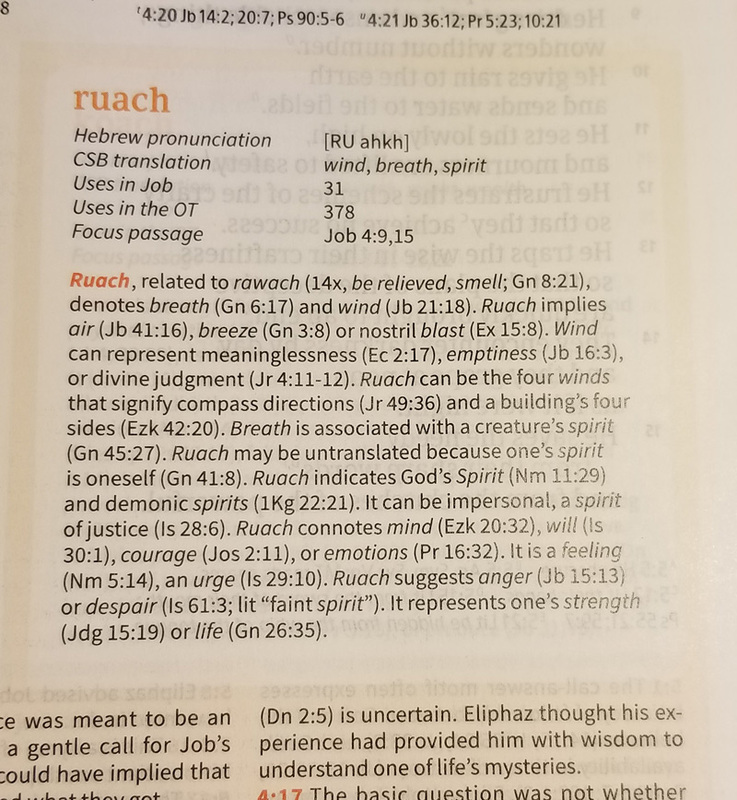 This includes the word in English, then in Hebrew, and then the page and chapter number within the book that it shows up. There are two sections in this – first lists the words our in canonical (Bible book sequence) order and then again lists them in alphabetical order by English word. 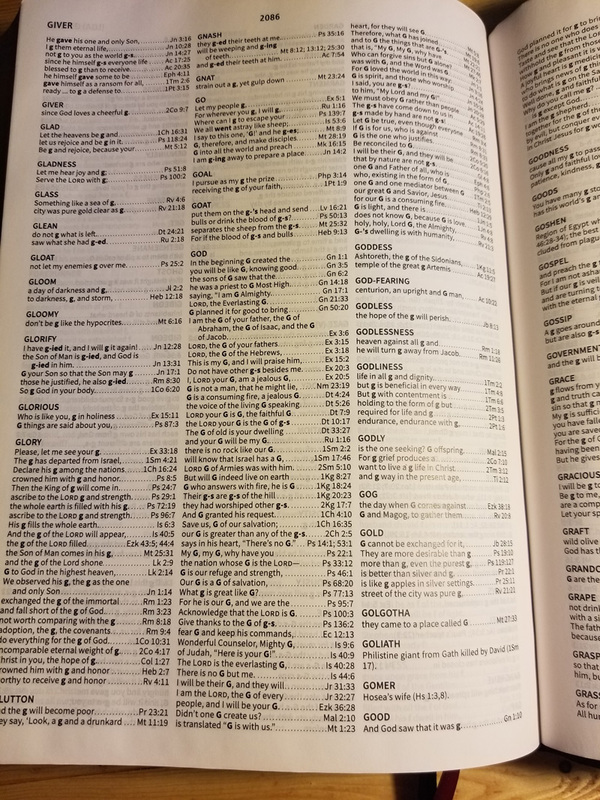 Three pages listing out the different Greek Word Studies that are in the CSB Study Bible. This includes the word in English, then in Greek, and then the page and chapter number within the book that it shows up. There are two sections in this – first lists the words our in canonical (Bible book sequence) order and then again lists them in alphabetical order by English word. Kind of a help for the translators’ notes to give you an idea for what abbreviations are used mostly in the Translators’ Footnotes. These 4 pages are the typical letter from the translators’ information which informs you how this translation came to be and the method the translators used when translating this version. I always recommend people to read these sections of their Bibles to understand some of the features and how your particular version was created. This seven-page article is a great introduction on how to read and study the Bible. Written by George H. Guthrie, this article really is a solid foundation on the why’s and the how’s of getting into God’s Word. In this three-page article, Brian H. Crosby shows how the Spirit is involved in the transformation of our lives and how He uses the Bible to do this. This six-page article by Jeremy Royal Howard, we learn about how the Old Testament came to be in its current form and current sequence and how it was passed down through the generations. This eight-page section covers the period of time that is recorded between the last Old Testament writing and the first New Testament writings. Granted, these are not necessarily accounts that are covered in the canonized Scripture, but they help fill some of these gaps that sometimes you might feel going from Malachi to Matthew. This four-page article by Jeremy Royal Howard, we learn about how the New Testament came to be in its current form and current sequence and how it was passed down through the generations. The Book Introductions are usually two to three pages for most of them. The first sections of the book introductions are fairly typical with an Introduction, Circumstances of Writing (including Author and Background), Contribution to the Bible and Structure of the book. They do have a nice timeline at the bottom of both pages that gives a nice background about Biblical and historical events that take place during the timeline surrounding this book. Like most of the CSB Bibles that I have encountered thus far, they followed suit in the CSB Study Bible with how they referenced Old Testament quotations/references just like they did in the publisher’s previous HCSB translation. They did this by using a nice bold font for the Scripture text that is the reference. This makes it very easy to see the references that are in any New Testament text to indicate Old Testament quotations or any obvious allusion to any Old Testament text. 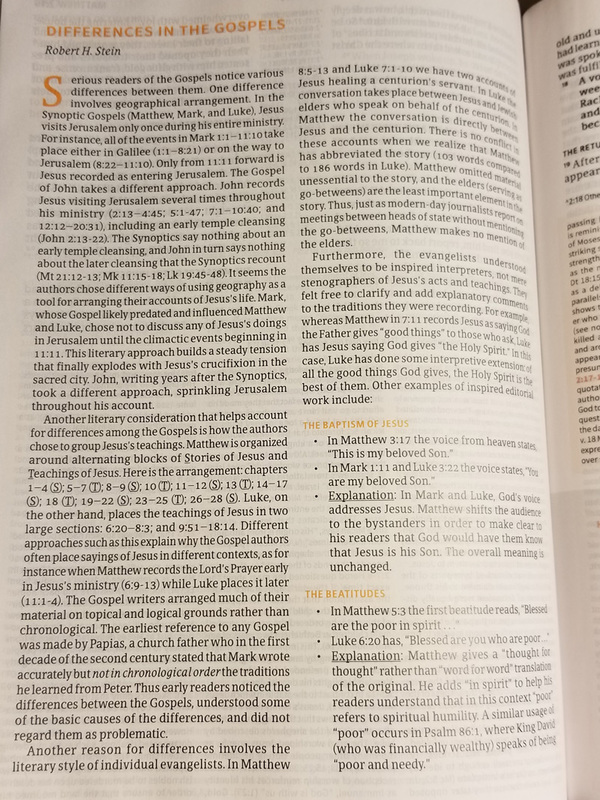 As I have stated in previous reviews of different CSB Bibles, this is my favorite method of identifying Old Testament references where they bold the font of the actual text in the New Testament. 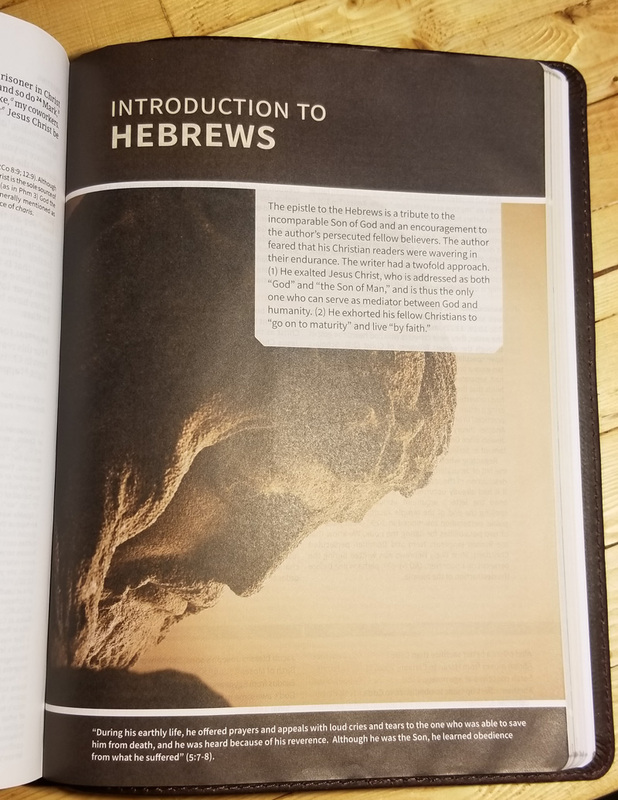 The study notes in the CSB Study Bible are very nicely done and feel to be a very balanced approach to notes – especially when it comes to any controversial subjects. There are a good number of study notes to help you understand the Scriptures better. At over 15,000 notes, you should be able to get quite a lot of understanding to help you with your studies and reading. The study notes, like most Study Bibles, are located below the Scripture text near the bottom of the pages. To more easily differentiate, the notes are a smaller font and also have a pale tan background to the notes. The study notes seem to be solid and easy to understand from the ones I have read through. I like the design how they have a tan-colored background to easily differentiate study notes from the Scripture text. There are 35 articles that cover some broad topics. While I did not read every single one, the ones I did read are very well written and helpful. Like a majority of Bibles on the market today, the cross-references are the center column and are a smaller text. Those with bad eyesight will have the same trouble reading these as with most other Reference Bibles. 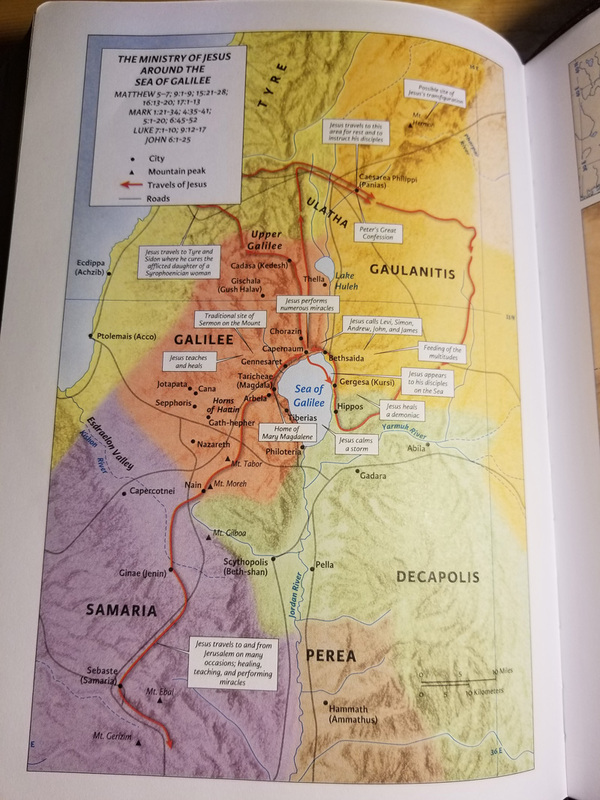 In addition to the normal maps that are in the back of almost every Bible, the CSB Study Bible also has maps throughout the Scripture text pages to help you get an idea of certain areas and events that took place with very nice graphical maps. I really do like the quality of these maps and the colors are not the over-saturated bright colors that are hard to look at. The color and design of these maps are extremely pleasing to use. 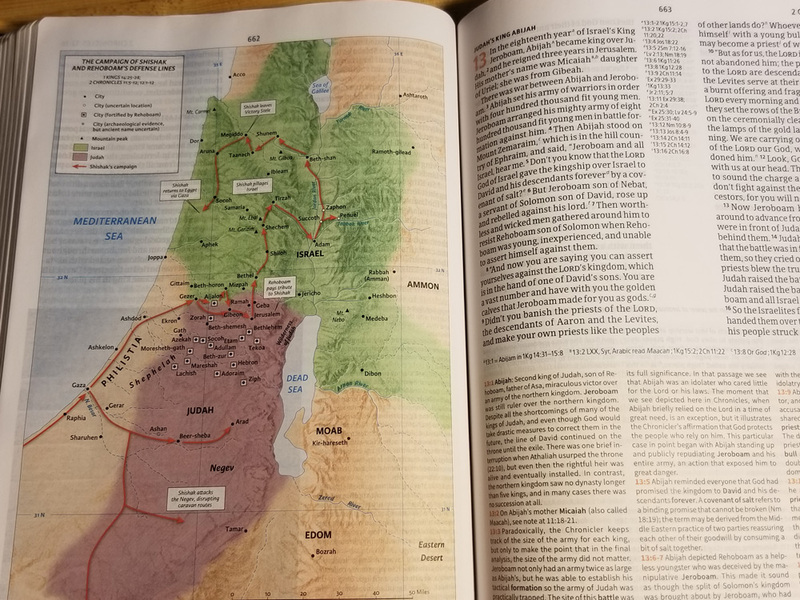 There are about 19 charts throughout the CSB Study Bible and each one has a slightly different layout, but overall they are extremely useful and well designed. There are 368 different Word Studies throughout the CSB Study Bible where they take a certain word from the original languages and give a definition as well as how many times it is used in the specific book and also in the Bible. I do like how they also provide the different words that the CSB translation uses when it encounters this word. These Word Studies are a very helpful tool for anyone that wants to do a little deeper dive. There are 21 illustrations that will help you picture what something may have looked like that is mentioned in Scripture. 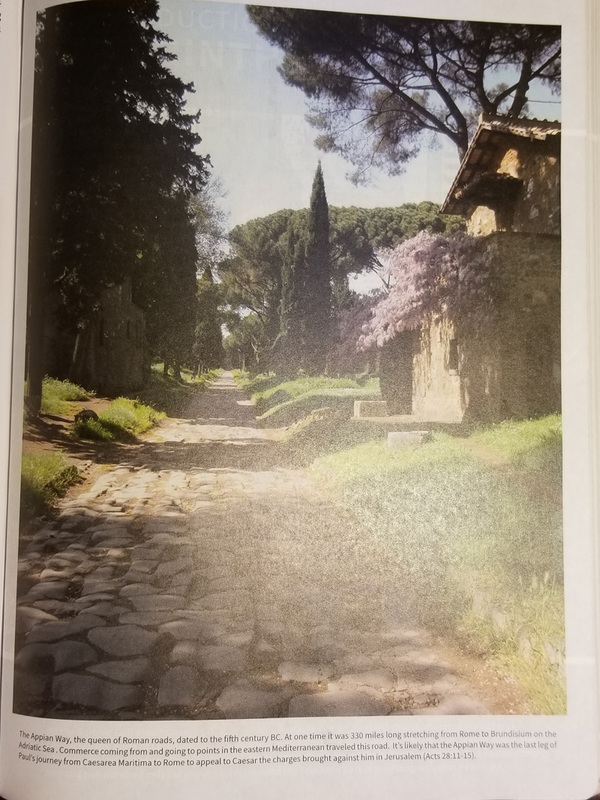 The CSB Study Bible has 94 different photographs of items and places, which provide an excellent visualization to help the Bible come alive even more to you. Timelines are a very helpful tool for you to put events into perspective. The events in the timelines within the CSB Study Bible are from both the Scriptures, but also some world events to help you put the timelines into perspective. They are fairly typical timelines that you may find in some Study Bibles. There is not a lot of room in the outside margins to write some notes. 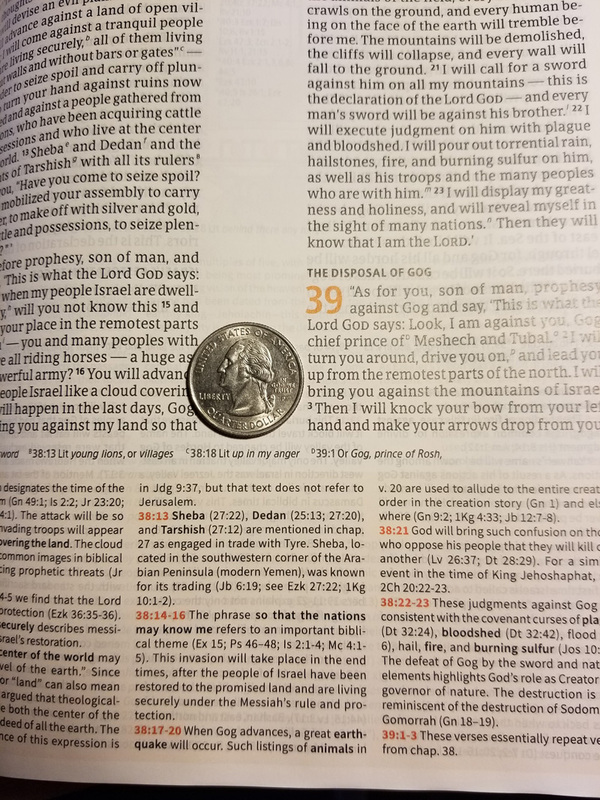 Approximately 3/8″ on the outside margin and about 5/8″ on the top margin (but the page number and book/chapter/verse indicators are there in the way). The bottom margin is about 1/4″ of space. So unless you write very small, this one is probably not for a heavy note-taker. Typical with most Bibles, the CSB Study Bible has translator footnotes on many pages that show how the translators understood the original Biblical language. This edition does have red letters for the words of Christ. It is not quite as dark red as what I normally prefer, but it not as pink-ish colored as others that I have seen. I would say this is pretty standard for the color I have seen in most Bibles nowadays. What Really Happened to the Apostles? This is a 6-page article that discusses the evidence that the apostles actually died as martyrs for their belief in the risen Christ. No Bible would be complete without having this handy chart included. 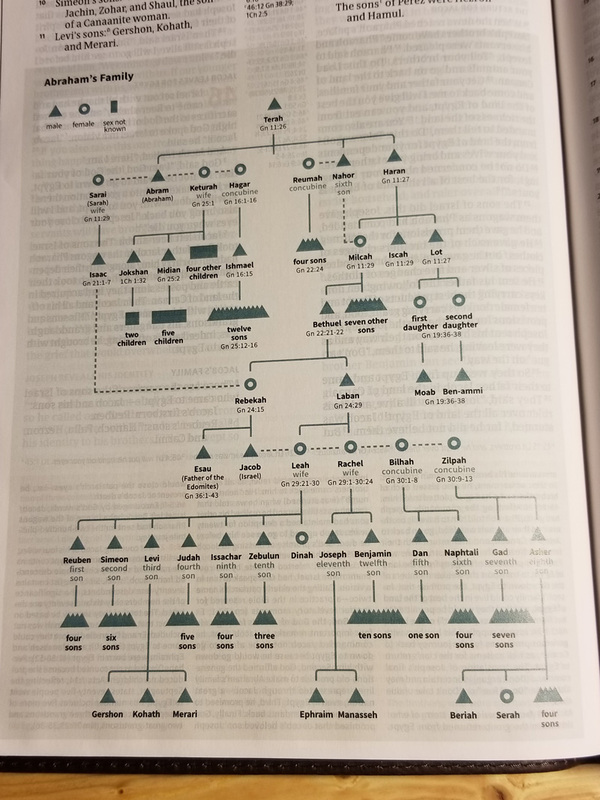 A fairly typical one-page chart that you find in most Bibles. This is a pretty decent concordance that is around 73 pages for the CSB translation. It is laid out very clean and is easy to read and use. There are two very nice Bible Reading Plans, which offer a choice of reading the Bible completely in a one-year or a three-year period of time. I haven’t seen this in many Bibles so far, but this is a nice way to encourage Bible memorization. It covers 52 weeks where each week, you memorize in a small section of Scripture (usually one to three verses) that is geared toward a specific topic, giving you a good overview of the Bible when you’re done. Also, if you are up for it, there is a Challenge memorization, giving you a second section to memorize geared toward the same topic. Two pages that cover the different photos, illustrations, and charts giving credit to its creator. 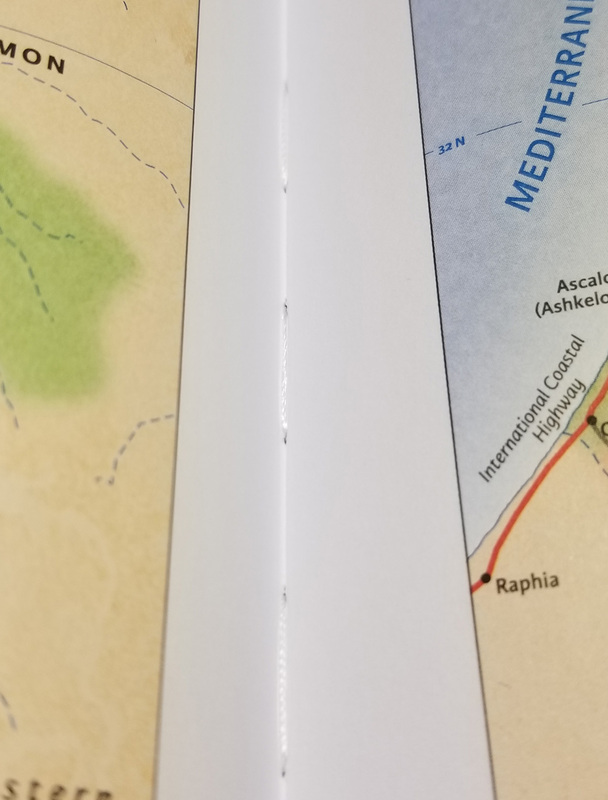 8 pages of additional full-color maps which are printed on very nice paper and pretty easy to read except a couple of them have pretty small text. If you have trouble reading fonts that are around a 5-point font, you may need some magnifiers for these couple of maps. Otherwise, these are very nice maps. OK, this is the part where I get to tell you about how I like or dislike this bible in a detailed manner. What I typically try to do is do a quick glance over the entire book at a high level to get a feel for it. I would say that this Study Bible is very easy to use. The layout is very nice and easy to follow. The study tools are written very well and presented very cleanly. Overall, this is a very well designed Study Bible. The study tools in this Bible are very helpful. They will be primarily from a Baptist background. From the articles and study notes that I read, it does seem pretty solid. Again, these are primarily from a Baptist background for the most part. I would say that this appears to be a durable Bible. 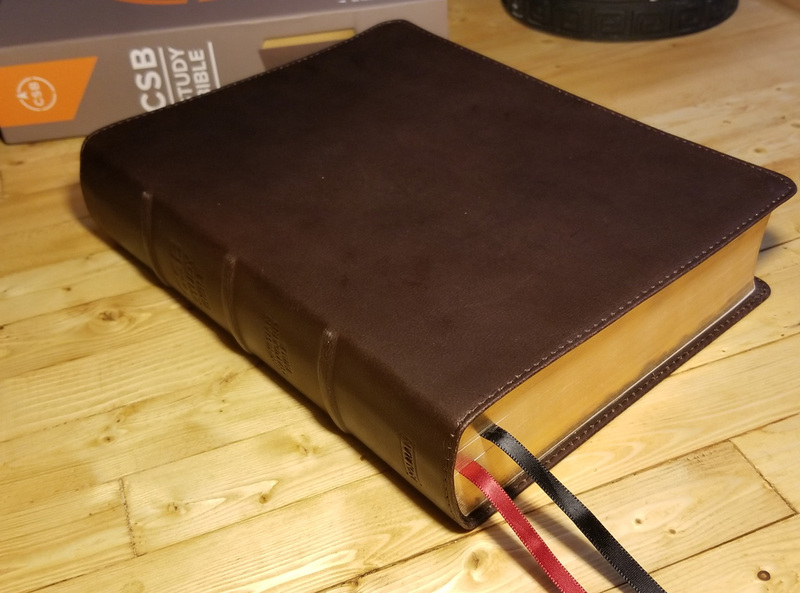 It is a genuine goatskin leather Bible for the version that I received which I think will hold up very nicely (which you can get hardcover or other versions as well – click HERE to see those options). With that said, this Bible is Smyth Sewn (or “section sewn”), which will help the durability of this Bible even more. 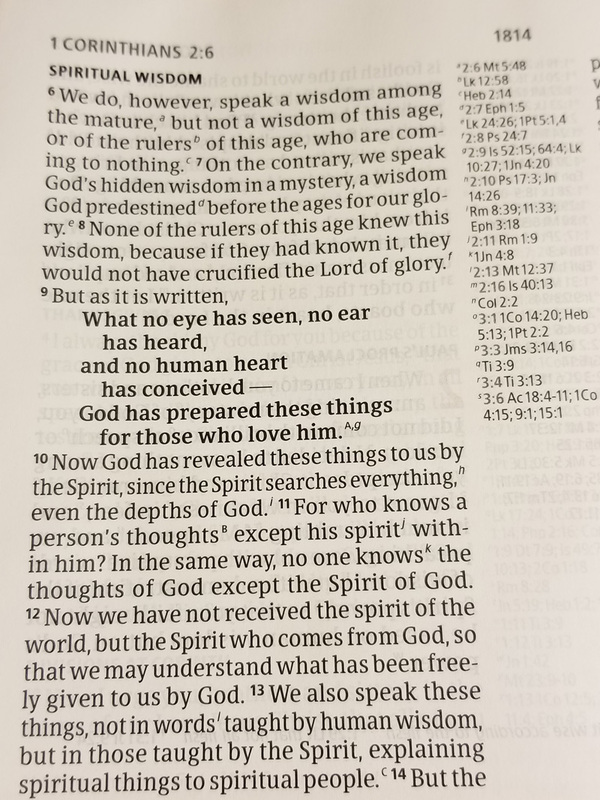 Scriptures appear to be at a very readable 10 point font for the Scripture text. The articles are just a little bit smaller at a 9 point font with the Study Notes at an even smaller 7 point font. 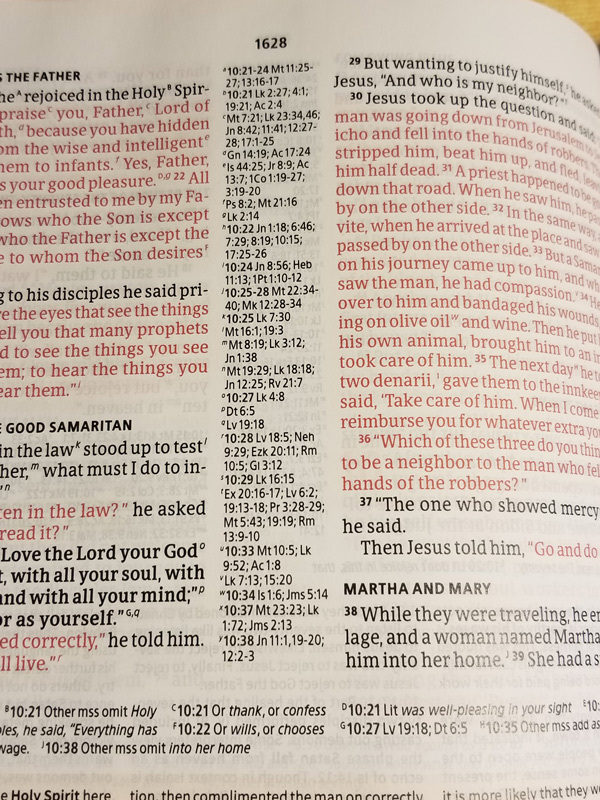 The line matching is something that is always a challenge when it comes to a Study Bible where you have more than just the Scripture Text involved in the design and layout. Line matching is where the printed lines on the front side of the page are lined up exactly with the lines on the back side of the page which makes the show through (where you can see the type ghosting through from the other side) much less apparent and easier to read. Study Bibles will always be challenged with this until someone comes up with a creative solution to this issue. However, with the paper that they used on the CSB Study Bible, the show through really is not too bad in my mind. 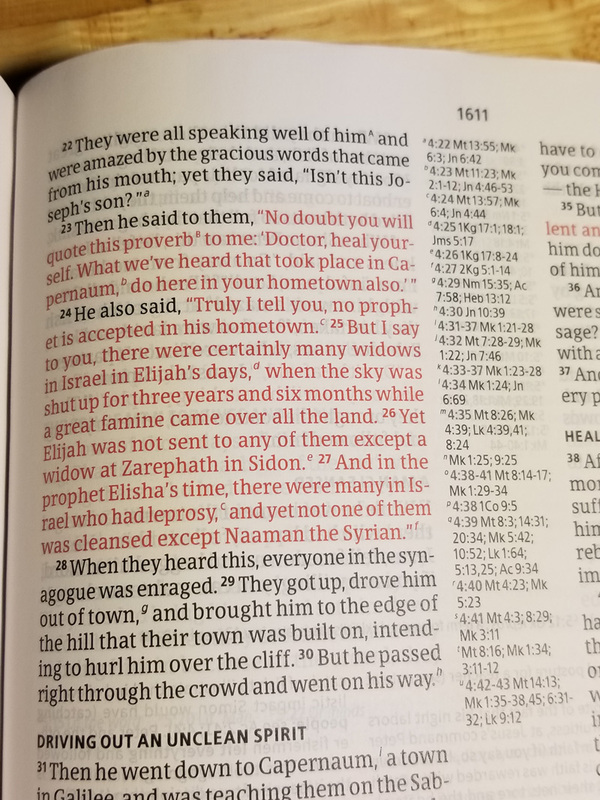 Plus if you look at the part of the page where there is only Scripture text on the opposite side, they actually did a very nice job line matching. To be honest, this one could possibly be the best line-matching I have seen for a Study Bible. The paper used for this Bible is actually fairly good. The opacity is not too bad, but not perfect by any means as you can still see the type through the paper (show-through). Some people who are more sensitive to show-through may not like it, but unless you print on a premium stock (and thus end up paying a lot more money for their Bible), show-through is just something you will have to deal with in most Bibles. The CSB Study Bible is no exception, but I would say the stock is probably mid-grade stock. Very pleasant, but not the best. Below, we have the overall ratings that I would give to this particular Study Bible with a 1 to 10 range. Keep in mind that when I am doing these ratings, it is based on the physical makeup, format, extra-biblical content and value of the Bible, not rating the Word of God itself. Quality: 9.7 – I am going to state that when I rate the “Quality” section, I am basing it partially on how the product is made when compared to the actual price. With that said, I would say that for the price of this particular Bible, you are getting a very good quality. It is a nice genuine goatskin leather Bible, and it does feel very nice in your hands. Appearance: 9.6 – The appearance of this Bible is very nice. The goatskin leather cover is a deep brown color that is very pleasant. The fonts used in this Bible are very pleasing and easy to read in my opinion. The design of the Scripture text and the study tools are very well done and a pleasure to use. I really do like the CSB Study Bible and it likely will become my every-day-carry Study Bible along with my ESV Study Bible. Value: 9.4 – I think that for the price of this Study Bible, you get a very good quality and easy to use Study Bible for a very good price. Innovation: n/a – Nothing pops out to me as overly innovative, so I am going to mark this section as not applicable and not include it in the rating. This is just a very good and solid Study Bible. Other/Wildcard: n/a – There aren’t any real wildcards for this one that stood out to me, so I am marking this section as not applicable and not including it in the rating. In 1993, A.J. Holman Bible Company was acquired by Broadman Press to form B&H Publishers. Then in 2014, B&H Publishing combined with Lifeway Church Resources. They are based in Nashville, TN and have roots that go back to 1738. This entry was posted in B&H Publishing, Bible Reviews, Bible Study, Bible Study Resources, Christian Living, Concordance, CSB, Genuine Leather, Goatskin Leather, Gospel, Greek, Greek, Hebrew, Holman, Key Words, LeatherLike, Lifeway, Maps, Reference Book Reviews, Scriptures, Study Bible, Study Bible Reviews, Studying, Trevin K. Wax, Word of God, Word Studies and tagged B&H Publishers, best CSB study Bible, Christian Standard Bible, CSB, CSB Study Bible, great study bible, Holman Bible Publishers, Lifeway, study notes, Trevin K. Wax, Word Studies. Bookmark the permalink.